LOS GATOS, CA — Just in time for Halloween comes something that might scare anyone who spends a lot of time online: SplashData’s annual list of the most common passwords used on the Internet and posted by hackers. 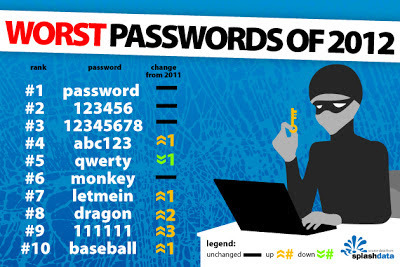 Users of any of these passwords are the most likely to be victims in future breaches. In a year with several high profile password hacking incidents at major sites including Yahoo, LinkedIn, eHarmony, and Last.fm, SplashData’s list of frequently used passwords shows that many people continue to put themselves at risk by using weak, easily guessable passwords. The top three passwords, “password,” “123456,” and “12345678,” remain unchanged from last year’s list. SplashData, provider of the SplashID Safe line of password management applications, releases its annual list in an effort to encourage the adoption of stronger passwords. SplashData’s top 25 list was compiled from files containing millions of stolen passwords posted online by hackers. The company advises consumers or businesses using any of the passwords on the list to change them immediately. Having trouble remembering all those different passwords? Try using a password manager application that organizes and protects passwords and can automatically log you into websites. There are numerous applications available, but choose one with a strong track record of reliability and security like SplashID Safe, which has a 10 year history and over 1 million users. SplashID Safe has versions available for Windows and Mac as well as smartphones and tablet devices.